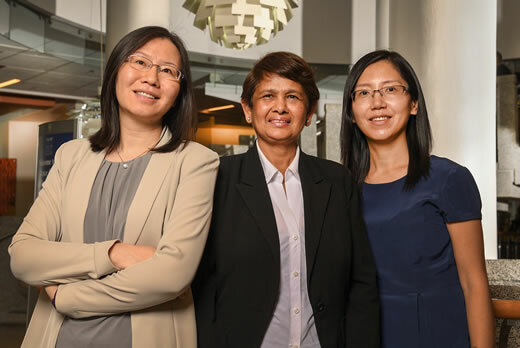 Emory biostatisticians Amita Manatunga, PhD, Limin Peng, PhD, and Ying Guo, PhD, Georgia Clinical & Translational Science Alliance (Georgia CTSA) investigators and experts known for their collaborative research, have been working together for more than a decade. They publish eight to ten papers a year sharing and rotating the role of lead author. Their collaboration led them to try and develop “new statistical methods that could allow them to identify neuroimaging or biologic biomarkers corresponding with different subtypes of disease classes as well as with other traditional clinical scales of mental disorders.” For more details on their collaborative research, click here. Amita Manatunga, professor of Biostatistics and Bioinformatics at Emory’s Rollins School of Public Health, has provided biostatistics support for many projects on behalf of the Biostatistics, Epidemiology & Research Design (BERD) program for Georgia CTSA. Manatunga is also a course director for Georgia CTSA’s High Dimensional Data Analysis course for the Master of Science in Clinical Research (MSCR) program and provide mentoring to many MSCR student theses each year. She also serves as a member of the Research Education Programs Executive Committee to review applications for the Georgia CTSA MSCR program, Certificate Program in Translational Research, and TL1 program as well as provide guidance on curriculum and instructors. Ying Guo, associate professor and Director for the Center for Biomedical Imaging Statistics at Emory’s Rollins School of Public Health. As a biostatistician in the BERD program she has provided statistical support on research projects and study designs and also conducted biostatistical screening reviews for study protocols and applications. She was awarded a pilot grant jointly sponsored by Emory URC and Georgia CTSA in 2009 for developing statistical methods for brain imaging data. Guo has multiple publications based on Georgia CTSA-supported studies. Limin Peng, professor of Biostatistics and Bioinformatics at Emory’s Rollins School of Public Health, has provided support for many projects for BERD. She is the recipient of the 2017 Mortimer Spiegelman Award given by the American Public Health Association for the outstanding research in statistical methodological research and contributions to public health and community. She has published extensively in methodological research, some of which were funded by Georgia CTSA. A key goal of the BERD program is to provide value-added assistance to markedly improve the quality of the translational and clinical research of Emory University, Morehouse School of Medicine (MSM) Georgia Institute of Technology (Georgia Tech), and University of Georgia (UGA) investigators. This is accomplished by having highly trained, service oriented BERD personnel from Emory’s Rollins School of Public Health, MSM’s Clinical Research Center & Research Center for Clinical & Translational Research, Georgia Tech’s Stewart School of Industrial and Systems Engineering, and UGA’s College of Public Health available to assist early career researchers in a timely manner. To request a BERD consult, click here. The Georgia CTSA is an inter-institutional magnet that concentrates basic, translational, and clinical research investigators, community clinicians, professional societies, and industry collaborators in dynamic clinical and translational research projects. Emory engaged three of its close academic partners – MSM, Georgia Tech, and UGA – to form the Georgia CTSA. This partnership, a strategic multi-institutional alliance, offers compelling, unique, and synergistic advantages to research and patients statewide.